One of my favorite things about summer is local tomatoes. There is nothing better than a tomato sandwich on toast with mayonnaise, salt and pepper. Divine! I actually like mine open faced so I can pile the tomatoes higher. My big sister knows how crazy I am for a good tomato and during a recent visit brought me a bag of assorted juicy red tomatoes from her garden – best present ever! The tomatoes from her garden are always the best of the summer. I don’t know if it’s the cooler temperatures in northeast Pennsylvania, the soil or all of the TLC she pours in to her garden, but they are heavenly. So I found myself with an abundance of tomatoes, the ones she brought me, ones that we had purchased and there were tomatoes in our CSA last week. Not a problem in my book, I have a lot of great recipes for tomatoes. One of my faves is from a cookbook my other sister gave me for a birthday gift – my sisters have my back clearly! Jessica Seinfeld’s Food Swings – Virtue &Vice is full of some really great healthy options and also some really devilish, decadent options for when you’re living it up a little. One of my favorite recipes from the book combines two of my faves – cauliflower and tomatoes. Preheat oven to 400° with the oven rack in the middle. Put the tomatoes and garlic in a large baking dish, then drizzle with 3 tablespoons oil and sprinkle with 1/4 teaspoon salt, pepper and red pepper flakes. Toss to coat. Trim the large green leaves from the cauliflower and dis­card, then trim the stem so the cauliflower sits flat. Push the tomatoes aside and place the cauliflower in the middle of the dish. Drizzle remaining tablespoon oil over the cauliflower and rub to coat. Sprinkle with paprika and remaining 1/4 teaspoon salt. Roast for about 1 hour, or until the cauliflower is tender and can easily be pierced with a paring knife. Sprinkle parsley over the cauliflower. Slice the cauliflower into wedges and serve with tomatoes and garlic. I know it doesn’t sound terribly exciting, but trust me, roasting it all together really brings out the flavors. The first time I made it, my husband Joe gave me that “I don’t know about this one” look, but found himself grabbing more Italian bread to sop up every last juicy bit from the plate. Tomatoes have a good dose of Vitamin C and the cooking process doesn’t effect it at all. 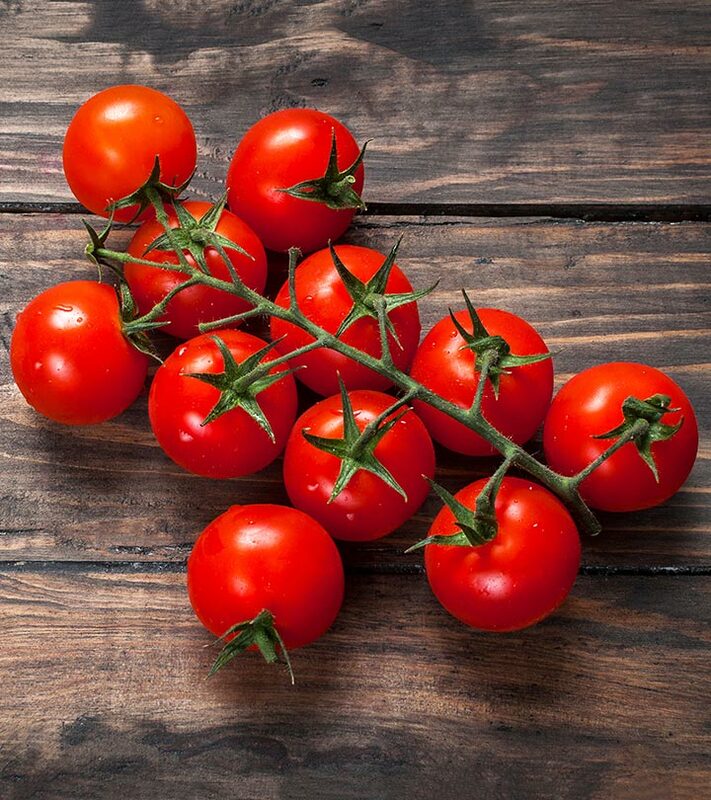 They also contain lycopene, which is an antioxidant and the cooking process brings out more of the lycopene. Tomatoes also contain beta-carotene, another powerful antioxidant to help fight cell damage. So this dish is tasty and healthy – that’s a win win!